For more than 40 years, PCB® has specialized in the design and manufacture of innovative sensors and measurement systems for the gas turbine market. In those four decades, our expertise in combustion dynamics instrumentation has met the industry's most demanding requirements for dynamic combustion measurement and turbine engine monitoring. With the move toward increased fuel efficiency and lower exhaust emissions, today's gas turbine engines are based on technological innovation yet also bring potential problems. Burning a leaner flame keeps NOx emissions low but at the same time increases instability (combustion dynamics) in the gas turbine engine. This instability can damage components in the combustion chamber such as nozzles, baskets and transition pieces, as well as downstream components such as blades, resulting in downtime and loss of production. IMI's combustion instrumentation is designed to detect and measure dynamic pressure spikes, pulsations and surges in gas turbine engines. 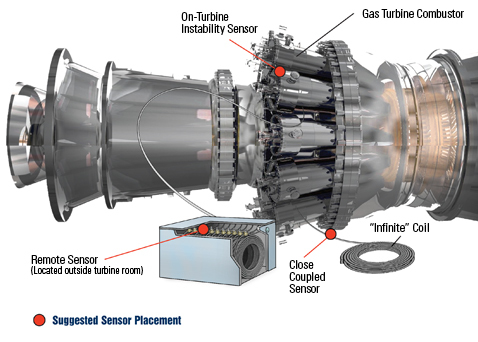 Our pressure sensors have three basic applications for detecting and measuring dynamic pressure phenomena and combustion instability in gas turbine engines: remote sensors, close coupled sensors and On-turbine Instability Sensors (OTIS). The diagram below shows a typical setting for a gas turbine in a power generation plant. Shown within the illustration are the three standard methods of measuring pressure: Remote, Close Coupled and On-Turbine Instability Sensor (OTIS). The red bullets indicate the location of the actual sensor for each method.